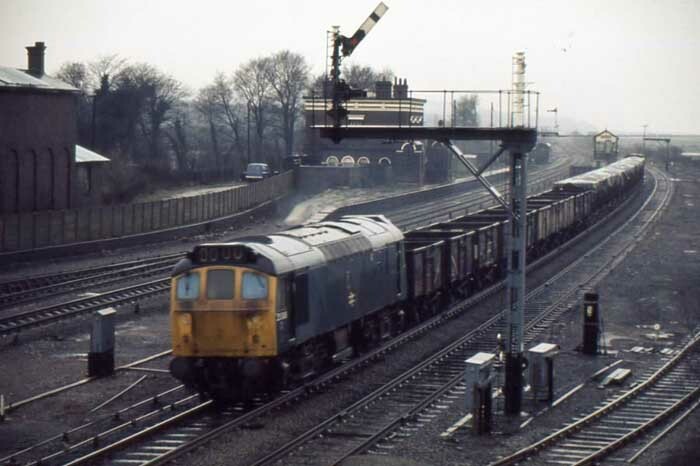 Photograph collection of webmaster A very damp February 23rd 1977 finds 25306 with a lengthy heavy train at Holywell Junction on the North Wales mainline. The working career of D7656/25306 totalled eighteen years and eight months allocated to London Midland & Western Region depots. Built: Beyer Beacock, Manchester No. 8066. When withdrawn 25306 was the 7th remaining vacuum brake only Class 25. Time between withdrawal & scrapping: 35 months. After withdrawal 25306 was stored at Cricklewood from February to May 1985, then moved to Swindon Works via Acton between May 3rd & May 15th 1985. The Works closed prior to the scrapping of 25306 so it moved to Cocklebury Yard, then on to Leicester Humberstone Road on June 3rd 1987. It moved into Vic Berry's yard the next day, then added to the pyramid by October 1987. It was removed from the pyramid late in January 1988 and scrapped by the middle of February 1988. 25093, 25126/134/161/164/180/193, 25207/208/260, 25306/327 Swindon Works to Cocklebury Yard, June 3rd 1987. 25093, 25180/193, 25306 Cocklebury Yard to Vic Berry Leicester June 3rd - 4th, 1987. Noted Derby Works April 1974. Noted Glasgow Works July - September (?) 1979 (General repair). Noted Derby Works August 1979 (rectification?). D7656/25306 did not acquire much passenger mileage, it appears its first recorded passenger working was its longest. On August 14th 7656 & 5261 worked a Liverpool - Ipswich roundtrip Everton football special, a total of 502 miles assuming the locomotives worked throughout. 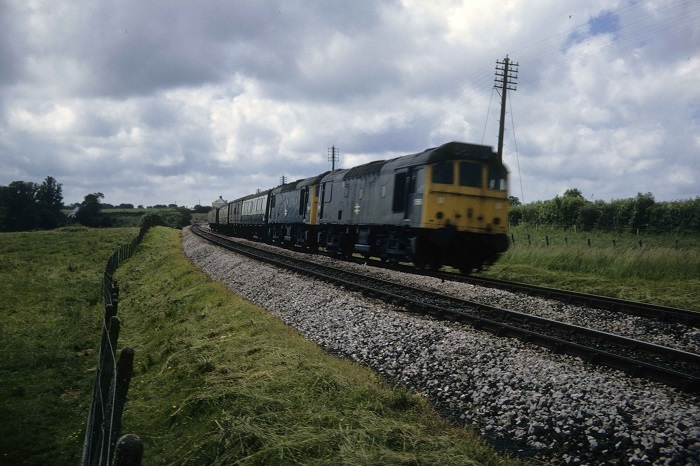 Photograph courtesy Roger Geach Class 25 Nos.7656 & 7624 work the 4A17 Penzance - Bristol Temple Meads vans at Dobwalls, Liskeard on Saturday June 30th 1973. 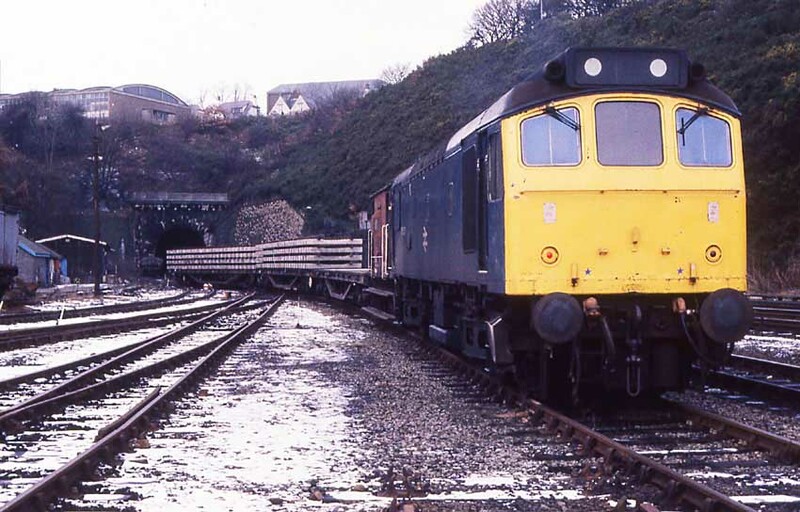 The Class 25s would work through to Plymouth and often return on the evening 6B31 Plymouth Friary - Truro freight. On July 23rd & 26th 7656 worked the 20.15 Exeter St Davids - Newton Abbot. On August 18th 7656 worked the 09.51 Exeter St David - Barnstaple, the 12.20 return, the 15.55 Exeter St Davids - Barnstaple and the 17.55 return. On August 25th 7656 worked the 15.55	Exeter St Davids - Barnstaple and the 17.55 return. Lenton permanent way yard was host to 25306 & 24087 on the afternoon of July 4th, arriving with a load of rails, later returning light engines to the west. On August 10th 25306 & 25290 worked the 09.10 Birmingham New Street - Llandudno Town forward from Crewe, returning with the 18.15 ex-Llandudno Town as far as Crewe. Photograph collection of webmaster Manchester Victoria again, but this time a rather unusual movement with 25306 hauling a Southern Region electric multiple unit from Horwich, perhaps. Since the view from 1977 25306 has been through Glasgow Works and has received a repaint, including the repositioning of the numbers behind the cab door. 25306 was noted passing through Whitehaven with a brakevan on April 22nd. 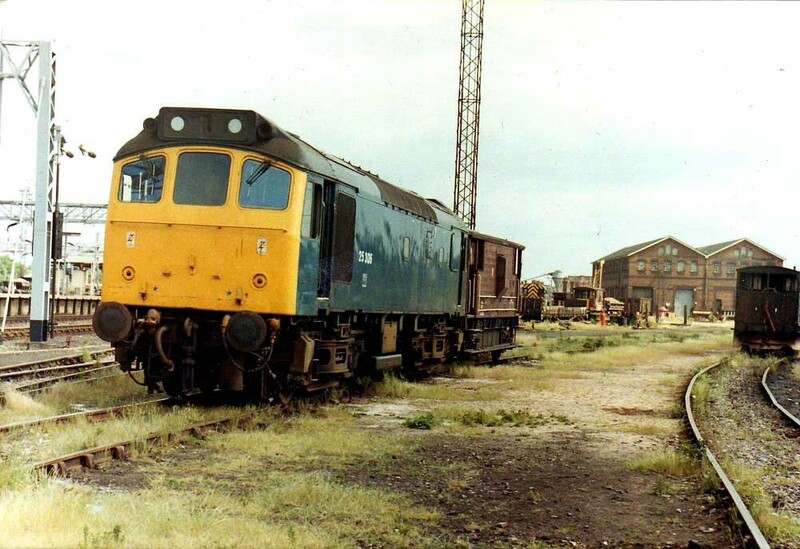 Photograph courtesy David Smith An interesting view of Nuneaton north end yard on June 30th 1981. Present are several different types of brake vans and other vehicles used on the ballast/permanent way workings. Front and center of course is 25306 waiting for the afternoon T43 working, whilst just visible is a Class 08. On August 15th the 07.52 Leeds - Llandudno Town failed at Chester behind 40170, 25306 dragged everything to Llandudno Town and then returned with the 14.00 Llandudno Town - York, see view below. Photograph courtesy Chris Baines 25306 departing an overcast Warrington with the 14.00 Llandudno Town - York on August 15th 1981. At least by York the sun was shining making for a pleasant afternoon. The two recorded workings during 1982 involved the north-west. On September 26th 25306 worked the 02.10 Crewe - Bangor, whilst on December 16th 25306 worked a Euston - Blackpool North relief forward from Preston. 1983 brought a small mixed bag of workings. On June 1st 25306 worked the 13.25 Crewe - Cardiff and the 17.15 Cardiff - Crewe and on June 6th (a Monday) it worked the 08.01 Crewe - Cardiff and the 11.40 return. Just over a month later on July 29th 25306 & 25276 worked the 10.10 Euston - Shrewsbury forward from Birmingham New Street. And on August 14th a relief 22.22 Stranraer Harbour - Euston required the assistance of 25306 & 25194 between Rugby & Bletchley, dragging 86324 due to the power being off for engineering work. Track alterations at Ilkley required a ballast special which was hauled by 25195 & 25306 on October 9th. 25302 & 25306 worked the 06.40 Severn Tunnel Junction - Carlisle (to Crewe?) on January 9th. 1984 brought the final year of passenger workings for 25306. 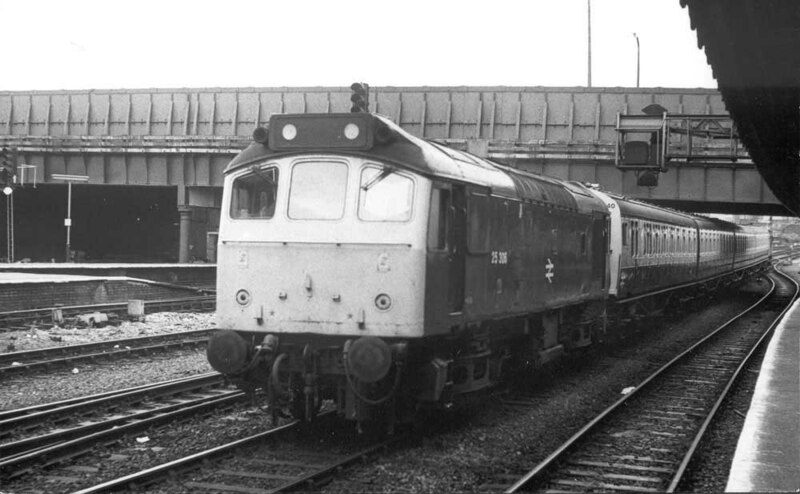 A diesel multiple unit failure on February 10th led to 25306 working the 07.00 Gloucester - Cardiff. Late on July 14th 25306 & 25251 assisted the 23.05 Manchester Piccadilly - Gatwick Airport service between Stockport and Stafford when the power was off for engineering work. Two weeks later on July 27th a late afternoon Bristol Temple Meads - York relief required assistance from 25306 between Leeds & York following the failure of 46026. 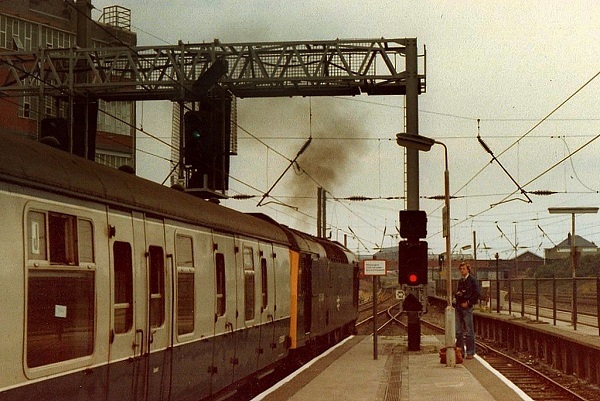 On October 23rd 31430 failed at Settle on the 07.38 Hull - Carlisle, 25306 took the train on to Carlisle and returned with the 16.35 Carlisle - Hull as far as Leeds. The final passenger working took place on November 2nd working the 12.30 Manchester Piccadilly - Cardiff to Crewe. Photograph courtesy Colin Webb 25306 at Bangor station on January 20th 1985, one month before its withdrawal. The two rear bogie track panel wagons are derailed and await the rerailing team. 25306 was withdrawn on February 25th 1985. A builders plate from 25306 (Beyer Peacock 1966) sold at Stafford Auctions for £820 during January 2018. Page added May 11th 2013. Last updated January 5th 2019.